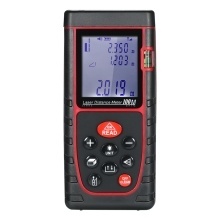 Laser Distance Meter: 40m/60m/80m/100m wide measuring range with ±3mm high accuracy. Unit Switch: measuring unit switchable among m(meter), ft(foot), in(inch). Display: 1.8" LCD with backlight for easy reading the data even in darkness. Mini Size: measuring size in 5"*2"*1, compact and portable to use and carry around. Auto-off: 60 seconds automatic shut down of laser, 480 seconds of the device. Data Storage: can save up to 20pcs data. Power Supply: just powered by 2pcs AAA alkaline batteries(NOT included). Water-proof & Dust-proof: with IP54 water-proof and dust-proof, which is no problem to operate under the construction site. Functions Including: Continuous distance measurement, Area measurement, Volume measurement, Pythagorean measurement, Plus/Minus measurement on area/volume/pythagorean, Min & max measurement value, Measuring reference switch, buzzer, etc.